Century 21 Covered Bridges Realty, Inc., located in Bloomsburg, PA, is a full service real estate company that can assist you in the sale or purchase of a home, land, or commercial property. The company was founded in 1981 during an era when interest rates were at their highest. Despite that economic climate, we charted a course of growth and stability that continues today. Much of this success story can be attributed to our attitude and emphasis on training and a commitment to advanced education which can be seen in the number of college degrees, professional designations, and awards earned by our real estate professionals. Training is an ongoing process to assure that all agents are aware of the changes in real estate laws and regulations and are prepared to serve clients needs with enthusiasm and competence. As with any company, we have set goals for ourselves. The primary goal we set in creating this organization was, has been, and will continue to be "providing the finest service possible to our clients and customers in satisfying their real estate needs." At Century 21 Covered Bridges Realty, Inc., our entire staff is comprised of friendly, well-qualified, selected professionals specially trained to handle all aspects of your move, from beginning to end. The management of Century 21 Covered Bridges Realty, Inc. is an open door management style, providing years of experience and support to our sales associates. Our mandate is to be the most knowledgeable in the fields of study that directly affect the sale or purchase of real estate. Our chosen group of exceptional agents allows the success story to continue today. Each of these individuals is dedicated to providing the highest quality of real estate service and committed to furthering their professional skill and education. 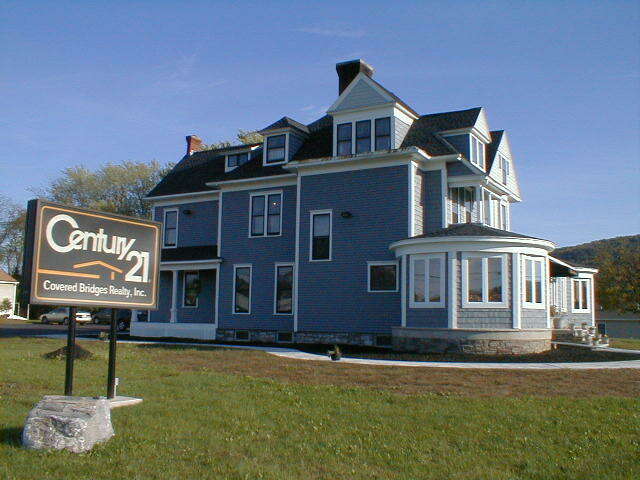 Century 21 Covered Bridges Realty´s prominence in the Susquehanna Valley is due to the company´s service-oriented philosophy, strong promotional strategies, and business practices of integrity and professionalism. We stay on the cutting edge, and light years ahead of our competition, by employing state of the art technology. When Century 21 Covered Bridges Realty, Inc. markets a property, the whole neighborhood notices! Keeping in mind the current market condition and trends, marketing real estate requires the vision to utilize innovative marketing strategies and techniques, a dominant online presence and aggressive advertising. Building on a trademark of personalized service, our company emerged from its humble beginnings to a powerhouse real estate company, while maintaining the intimate, neighborly type of service on which we pride ourselves. The real estate professionals at Century 21 Covered Bridges Realty, Inc. are highly educated, technologically sophisticated, and committed to providing the utmost level of outstanding real estate service possible. We are sure you will be most satisfied...after all, that is our goal! Century 21 Covered Bridges Realty, Inc. was founded by two women in 1981 in a predominantly male local marketplace. In order to survive with escalated interest rates, very little capital, and no inventory, the decision was made to become part of the world´s most recognized name in real estate, Century 21. As the saying goes...location, location, location! All the benefits of the Century 21 system were crucial in our success as well as finding a prime location with high visibility. Thus, the beginning of the circle... Realizing that Route 11 was the location of choice, and a prominent local businessman, Tennis Seiple owned land for commercial development, the negotiations began. The transaction for acquiring the site for this new company was sealed in the living room of the Seiple home on the corner of Lackawanna Avenue and then Market Street in Espy. For the past 25 years the company has grown from those humble beginnings and has flourished. Now in our fifth location, all within a few blocks of our original site, and one of the founding partners remaining to help chart our course, we returned again to that familiar site, the Seiple home. RBR Realty, an investment partnership affiliated with Century 21 Covered Bridges, Inc., purchased the former residence which has a very colorful history. Ted Fenstermacher, in his historic account entitled, "Tracking Yesterday", indicated that "it (the dwelling) could, and probably will, make a great subject for one of the house and garden magazines." Excerpts from his publication are included in the following. For many years, the large and beautiful dwelling was called the McCall Mansion. "Originally the Bradbury Mansion, the dwelling had been a real showplace for decades after it was built. That situation continued for a long period after the late Dr. McCall purchased it, but it eventually fell upon hard times. After the doctor´s death, Miss Dorothy McCall, his daughter, returned to Espy to live in the dwelling along with her sister, Jenny, also a spinster, and her two brothers, Harry and David." These siblings existed on a pitifully small income which was frequently supplemented by the sale of valuable antiques. When all the siblings had died, the ownership had gone to a niece, Emily McCall, who had 28 felines as companions. Sale of the antiques continued until Emily died. The Seiples had been negotiating to purchase the mansion prior to her death and became the new owners in 1972 when it was in sad condition. The Seiples had envisioned the possibilities of the home and worked for many years on its total refurbishing, eventually calling it "home" in 1981. During the renovations, Seiple found a board, containing handwriting, attached near the chimney. It reads, "This chimney built August 20, 1896 by Jeremiah Gross, bricklayer and stone contractor.J.D. Shaffer contractor and architect." "First time visitors are amazed at the spaciousness. Right in the center of four, big, adjoining rooms on the first floor are four fireplaces-back to back. They are across adjoining corners of the four rooms. The Seiples had new brick and fire brick installed, along with a new chimney, and then had the original fronts of the fireplaces put back in place." All the woodwork remained in gorgeous condition.